Almost no one speaks English. While miming can get you pretty far (acting out "airplane" to taxi drivers is always fun), even some standard hand signals (asking for the menu or the check, basic numbers) seem to be lost. And with vast differences in dialect across the various regions, attempting to learn a few words doesn't seem to help much either (and has often gotten me blank stares). Luckily most hostels seem to have at least one person on staff who speaks English well, and I've resorted to asking them to write me post it notes in Chinese characters if I need to run a specific errand. Translation apps can also be helpful (if they work), and I screen-captured some common words to show if I need to. Learning the hand signals for numbers is also helpful: 1-5 are obvious, but 6-10 are still signaled using a single hand, and I'm sure the locals would be genuinely baffled to learn that the rest of the world does not communicate this way. 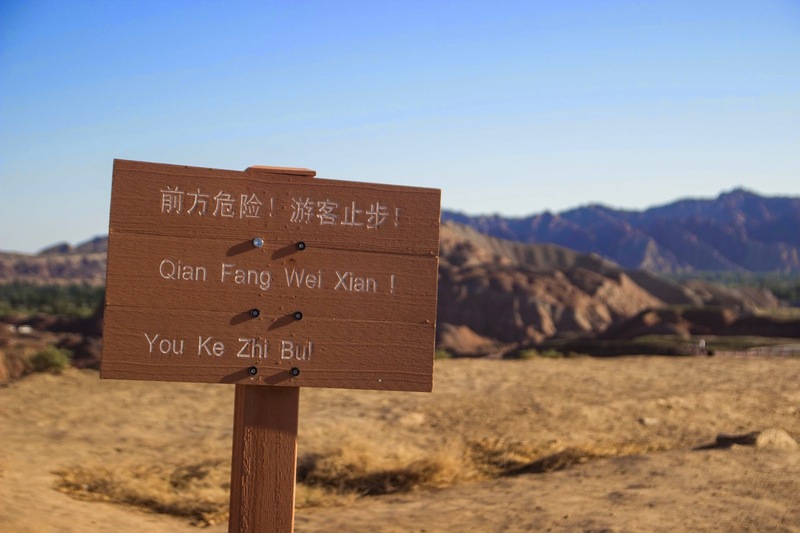 A "translated" sign in Zhangye. Y'know, because the Chinese is phonetically written with English letters. The internet is broken. Or rather, most everything you're used to using is blocked. This includes Facebook and any Google app out there. For someone who had been reliant on Google Voice for text and Google Translate and Facebook, it can be a challenge. Wifi is also quite expensive, making more scarce than in other countries, and surprisingly slow given how otherwise modern China can be. Note: Since I left, it's gotten even worse - Instagram is also blocked, and even many VPN services have been disabled. 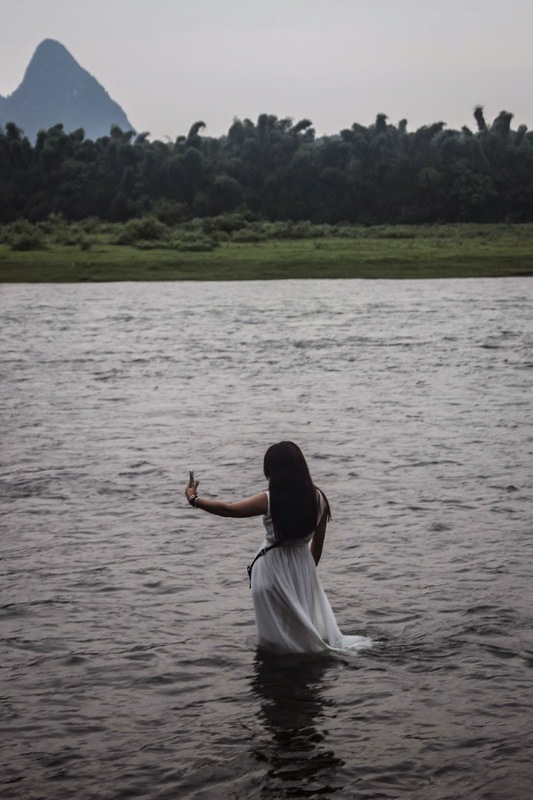 That selfie won't be going on Instagram or Facebook. Baby bums. 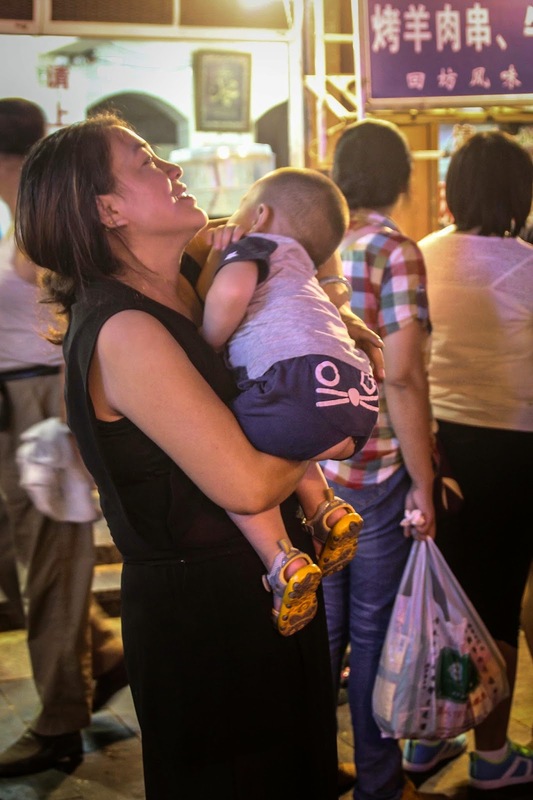 Diapers are a rare sight in China, and you'll probably see quite a few baby bums and other bits. A common practice is to put very young kids in pants with large slits in the bottom. You'll often see these littles either popping a squat in the middle of the street or their parents holding them over a trash bin to do their business. While I'm sure they save loads of money on diapers, protect the environment, and teach potty training much earlier than western countries, the lack of sanitation just feels icky, especially when you wind up sidestepping a smear of poo on the ground inside the Terra Cotta Warrior Museum or are walking past a small child being held at adult chest level, doing his business in a trash can. Where is the restroom? Many restaurants and business simply lack the plumbing for their own toilet facilities, but there are generally public restrooms fairly available throughout the cities. However, these can sometimes be hard to locate if they're in an alleyway off a main road or on the second floor of a shopping pavilion. As for toilet paper, bring your own. Many restaurants hand out small folded packets of tissues that myself and other foreigners hoarded like gold in case the need should arise. If a restroom actually does have toilet paper, it's usually in a single roll in the center of the bathroom, rather than in each individual stall. And unless you're in a place with it's own western-style toilet, it will definitely be a squatter. Bathrooms often lack soap, and rinsing with a bit of water seems to be an acceptable level of hand-washing, even for food-service personnel. The best I could do was carry a lot of hand sanitizer. Actual soap in a restroom!!! A nation of contrasts. Despite his hatred of all things capitalist, Mao's face graces every banknote in the country. He still seems to hold some god-like reverence, despite his oppressive cultural revolution that destroyed so much of the country's incredible heritage. 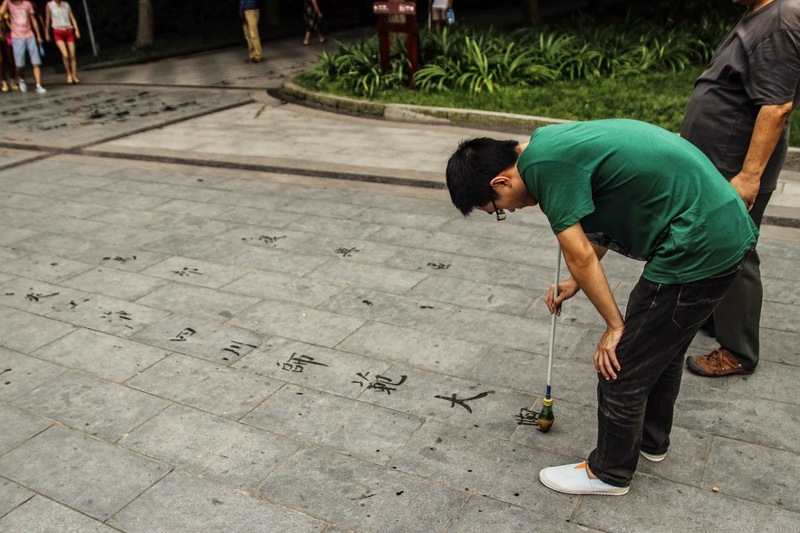 The Chinese have long been a people of hard work and innovation, but I can't help but wonder how much more they could accomplish if they were encouraged to think more freely and independently. Fashion. Being of a more collectivist mindset, you'll often see people dressed to match. Couples in the same shirts and color schemes. Mothers and daughters in matching dresses. Friends wearing identical outfits, walking arm in arm. A social faux-pas in the States is celebrated here. You'll also see a lot of knock off designer goods, enormous English text on tshirts that only sometimes makes sense (often leaving me wondering if they have any idea what these shirts actually say), and women in very short shorts and very high heels, but with their shoulders covered out of modesty, of course. 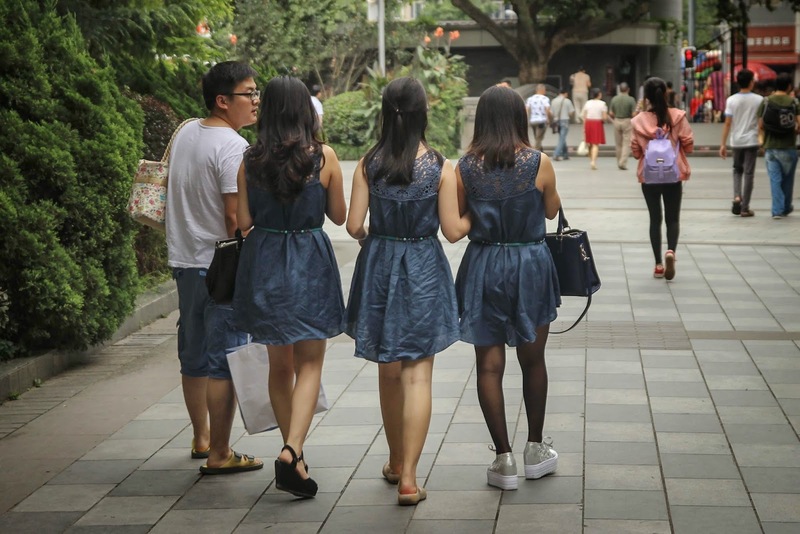 A trio of matching girlfriends in Chengdu. 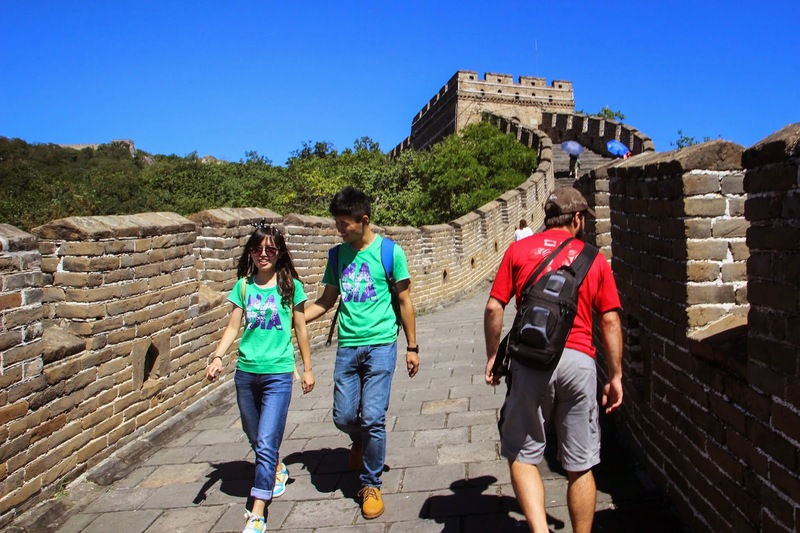 A matching couple on the Great Wall. 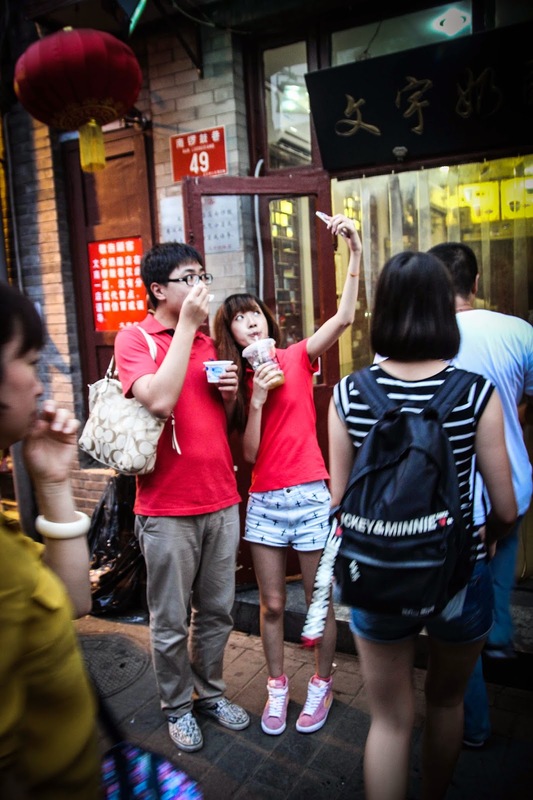 Matching couple takes a selfie in Beijing. Nonsensical English phrases find their way onto a lot of clothing. Eating is a group activity. 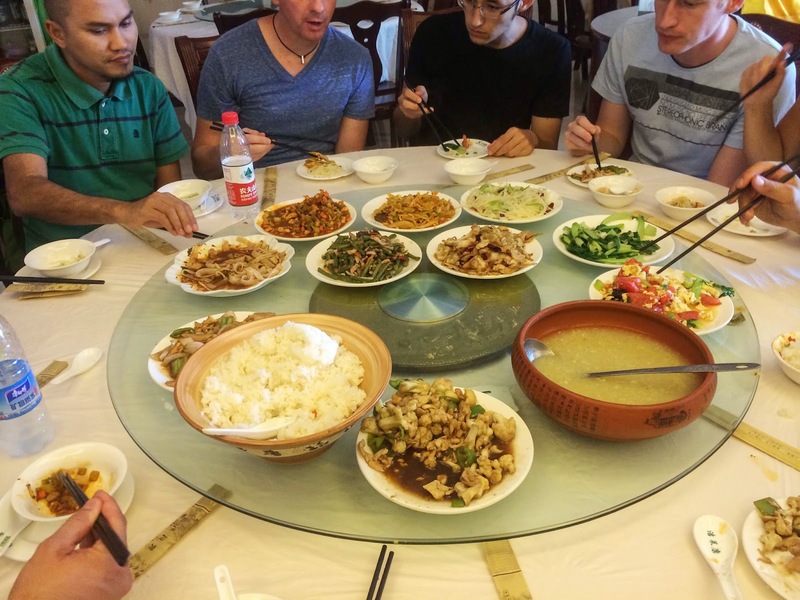 While most countries in Asia typically have family-style shared meals, I actually struggled a bit eating on my own in China, as there simply weren't often options that worked as complete meals on their own (outside of the confines of the hostels I stayed in). I reveled in any opportunity to share meals with other people so I could actually sample a complete meal, and otherwise I ate a lot of dumplings. Oh, and germ-a-phobes might have a hard time with this one - those chopsticks you're eating with? Everyone is using them to dip into the various dishes to serve themselves, throughout the meal. Eating family style in Xi'an. The people can be incredibly friendly. Despite the language barrier, many people are very friendly and willing to help. If you do wind up running into someone who speaks English outside of your hostel, they will probably want to chat with you, and they will go out of their way to help you. When my bus dropped me off in Yangshuo and the tuk tuk driver couldn't read the name of my hostel in English and I couldn't get the hostel on the phone, I said loudly, "does anyone speak English?" and immediately a man with his entire family in tow stopped to look up the name of my hostel in Chinese and explain to the driver exactly where it was. When I was running late at the airport and had a very tight window in which to check my bag, I asked a woman if I could skip ahead of her (and her mountains of luggage) since I had so little time. Not only did she graciously usher me ahead, but she went to every other person in the line and asked them to let me pass, which they did with smiles on their faces. 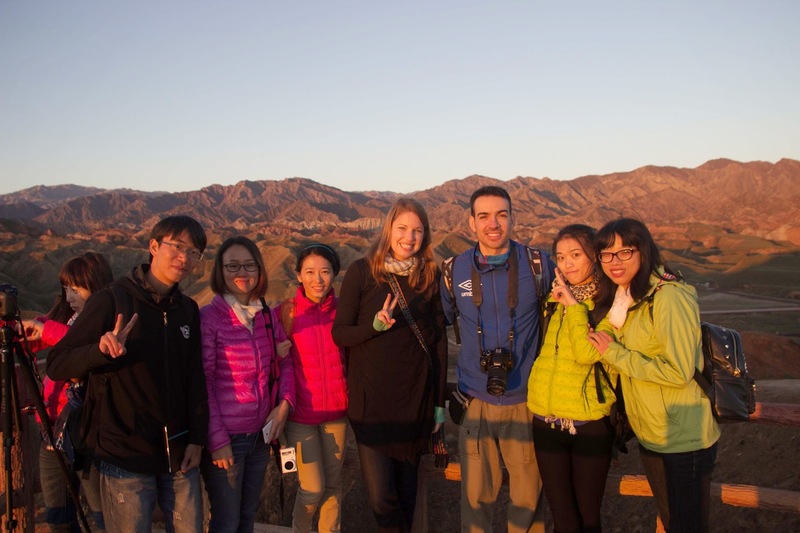 An incredibly friendly group of Chinese tourists in Zhangye. A Chinese tour guide who chatted with us for an hour in Chengdu, offering his opinions on current politics. But you are not a special and unique snowflake. In these individual encounters, people are wonderful, friendly, helpful, gracious. But when you are simply part of the crowd, you are likely to feel disrespected. But it isn't them, it's you. Well, mostly. Asians in general and Chinese in particular have mastered the art of not giving a f----. They are absolutely not bothered by things that would drive most westerners absolutely mad. And as such, I'm pretty certain they wouldn't ever expect you to be bothered by some of these behaviors, whether it's talking loudly on the phone, playing music or TV shows in public at high volumes with no headphones (at all hours), loud throat-clearing and spitting, pushing ahead of you, invading what you feel should be your personal space, smoking absolutely everywhere (usually in view of no smoking signs). While I think we could stand to learn a bit from them in not letting these would-be annoyances get to us and not feeling personally affronted by them, I also think they could stand to have a bit more respect for others. Unfortunately this also can carry over into some very ugly individual behavior as well, as I occasionally found myself the bad end of a joke (my driver found it absolutely hilarious that I had missed my flight in Zhangye), despite a culture that values "saving face", and I did find some very rude and unhelpful "service" personnel, though those seem to exist at both ends of the spectrum in every country. The men are kinda gross. Sorry, I know it sounds ignorant, and I know I'm reiterating the above, but really. The vast majority of Chinese men I encountered would loudly clear their throats, usually spitting, usually every few minutes. And even more smoked so much that I honestly wondered if it's was government plot against population growth to keep them in cigarettes and smog or simply a lack of care. The lack of respect for others is taken to a whole new level with these two activities. Most businesses, restaurants, etc. allow smoking or simply don't care. (Thankfully, public transit is strictly non-smoking. But not trains.) When I visited the Great Wall, I noticed two male bathroom attendants come into the women's restroom (weird enough as it was), sit down, and light up a pair of cigarettes, even though there were shady benches outside where their smoke could have dispersed into the air just right outside the door. Sitting on the patio of a nice Peking Duck restaurant in Beijing a few hours later, I spotted a younger man out on a date who chain smoked through the entire meal while also purposely coughing up phlem and spitting every few minutes. Somehow, the woman didn't seem at all bothered. While I did see a small handful of women participating in both of these activities, it seemed a national pastime for the men. Respect the queue? Standing in line in China is more akin to a rugby scrum than an orderly act. Disregarding any personal space for respect for who got where first, you are pushed into a swarming mass of people jockeying for position, a total free-for-all. This is all perfectly normal behavior, and again, people aren't bothered by it. Admittedly, this was one case where I was quite happy to be a bit taller than average, as I could keep my head above water so to speak. 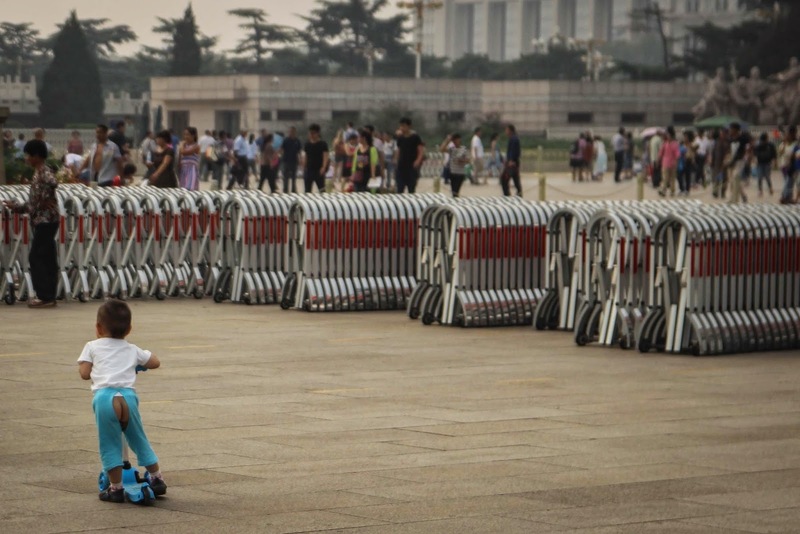 Jockeying for position in Beijing. 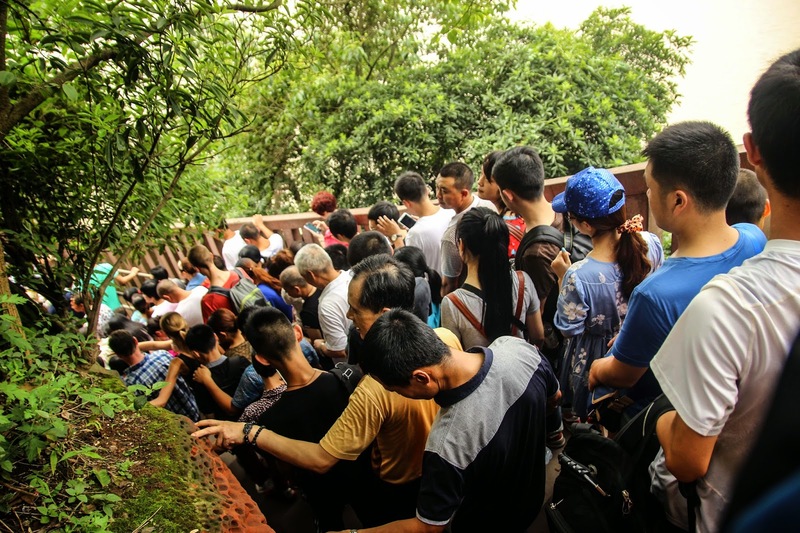 The queue for the Giant Buddha in Leshan. 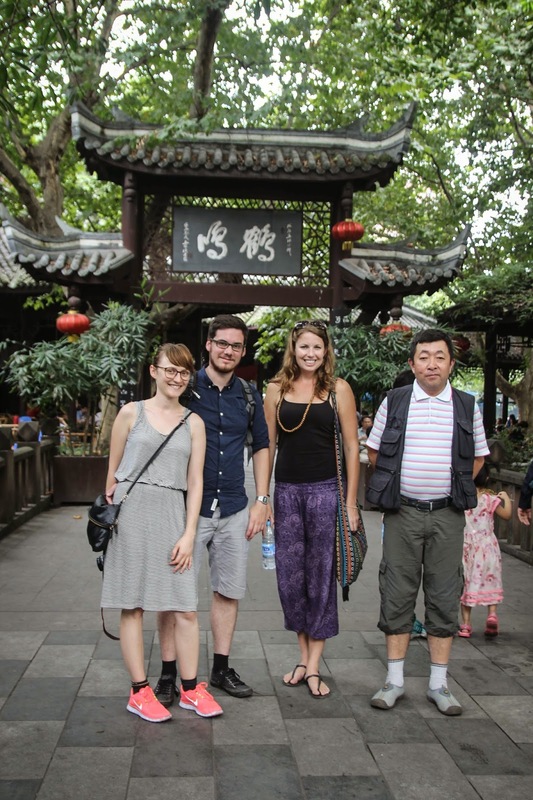 In total, China was beautiful and amazing, but challenging. I don't honestly know if I would have done it the same way given the opportunity. 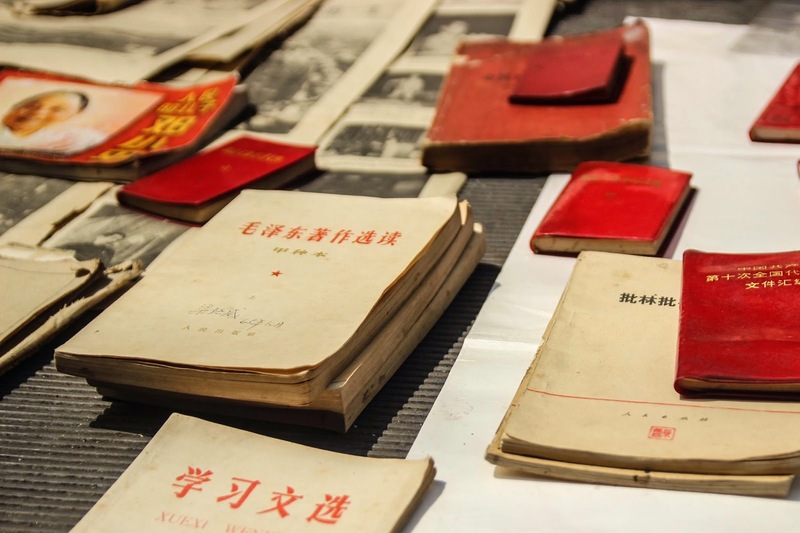 Because of the nature of my travel, I haven't been able to spend as much time researching individual places as I might for a normal vacation, and China sort of demands research. If you can afford to stay in nicer places that cater to tourists or hire drivers and tour guides, you'll probably have an easier time as they will be more English-friendly and help you navigate, but you will lose some of the authenticity of a visit. I was also very, very, very lucky to have a few friends from the States who lived in China and helped me get around in the last week of my visit to the mainland, giving me a much-needed break after nearly three weeks of struggling and stressing a bit more than normal. However, sometimes it's the most challenging places that stick with me the most - certainly that provide excellent fodder for stories - and I wouldn't mind revisiting China at some point. Perhaps with a little more knowledge, research, and friends who speak the language. 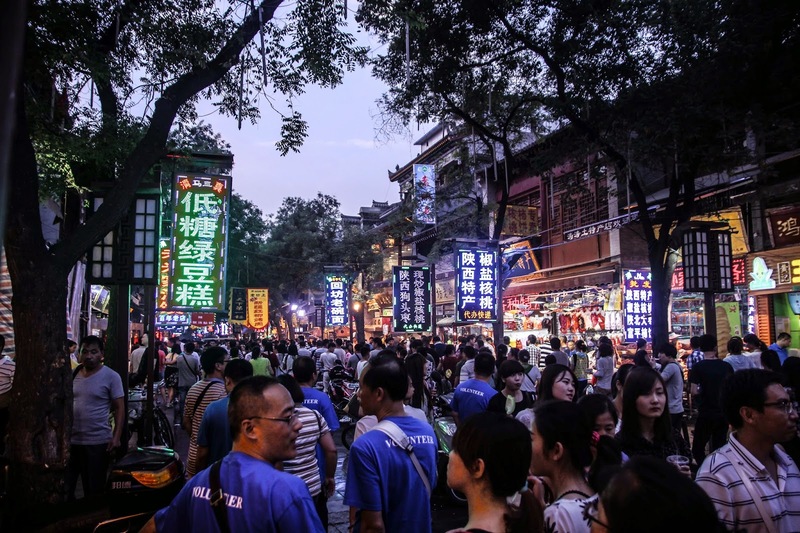 I have been to China on more then 30 occasions and China still makes me culturally anxious. You are right - its a beautiful country but its a challenging country too! 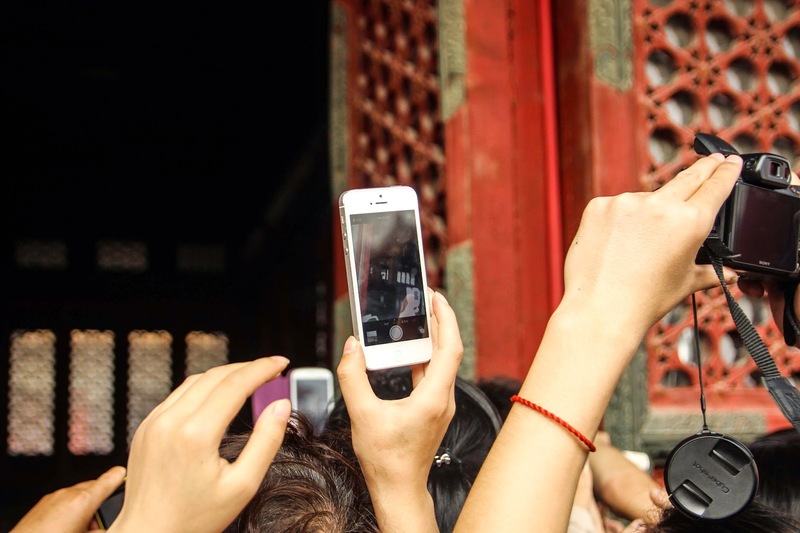 Great post, lots of things I didn't know about China. I can't believe that about the little kids, though! 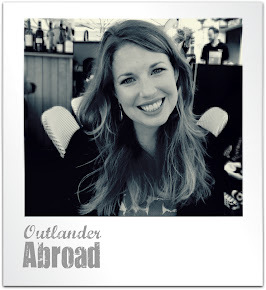 Culture shock, indeed.